Maintaining a healthy diet is a tried and true method of healthy living for people of all ages. As we get older, though, more attention is required in order to meet our nutritional needs. Unfortunately, many of our elderly residents are not eating as healthy as they should. Malnutrition at this stage in life can be very detrimental, and considering that roughly 3.7 million senior citizens suffer from this issue, action needs to be taken. Lares Home Care is here to help residents retain their independent living in Matawan and much of New Jersey. Senior home care can be very helpful for aging seniors and their families, and our professional independent living aides are here to help! By providing comprehensive elderly care services, our staff is able to help seniors maintain their lifestyle while alleviating some of the stress and worry experienced by their loved ones. One area we specialize in is food preparation and grocery acquisition to encourage healthy eating. 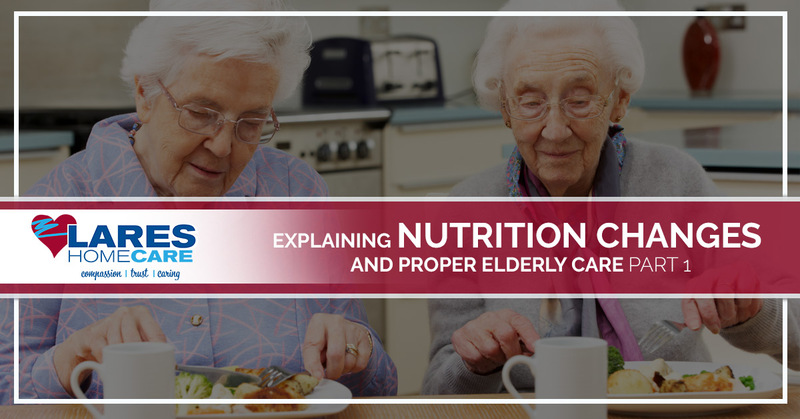 Today, we’ll look at a few changes that elderly residents experience that can explain the marked change in nutrition. Taste. As we age, our taste buds begin to wane. This results in the classic complaint that things do not taste as good as they used to. Once your taste for sweets and salt diminishes, foods often taste more bitter. Smell. Losing your olfactory capabilities can also affect the flavor of food. Orthosonal olfaction is the act of acquiring a scent through the back of your mouth, influencing the overall flavor. When smell starts to fail, flavors can go with it. Hearing. While not directly related to taste, impaired hearing can affect the intake of nutrition. Oftentimes, people suffer frustration and anger at not being able to converse with their meal partner, discouraging social eating and limiting the venues at which dining occurs. Dental health. Many senior citizens struggle with oral issues, and painful issues can inhibit their ability to enjoy food. When this is combined with poor nutrition, the results are often negative. Energy levels. Typically, your metabolism and exercise decrease as you age, reducing the demand for calories. While not necessarily a negative factor, this can help to explain why many seniors eat less and less as they age. Body functions. As we age, our organs begin to decrease in function, creating numerous changes throughout the body. This fact, plus your overall health, can play a major part in dietary preferences. Obtaining the right nutrition for seniors is a top priority for our personal care assistants! No matter what you or your loved one needs to obtain optimal independent living in their Matawan home, we are ready to help. Next time, our blog will continue this topic by looking more at the importance of proper nutrition for senior citizens. By offering quality services for all aspects of life, our senior home care program can give your loved one the freedom they deserve while keeping your mind at ease. Contact us today to learn how Lares Home Care can improve your family’s lives!